We bring you the latest news and analysis from Turkey's operation to clear the YPG from Syria's Afrin city. The YPG is an affiliate of the PKK, which NATO and its allies regard as a terrorist group. The Free Syrian Army has announced that together with the Turkish military they have entered the northwestern Syrian town of Afrin as the YPG pulls out to regime-controlled areas south of the enclave. After US attempts to mediate, Russia deployed troops to the area to stop an operation on the YPG in Afrin last year. On January 20, Turkey started the operation. Here is the importance of their strategy. Civilians greet and show hospitality to Turkish soldiers and the Free Syrian Army members after they cleared the YPG terror group from the Afrin town centre on Sunday. Turkey has launched a border-security mission in Syria's Afrin in a bid to clear the area of PKK-affiliated YPG. TRT World explains the PKK in 10 questions. Why is Turkey’s military fighting the YPG in Afrin, Syria? Turkey has just launched a military campaign in Syria called ‘Operation Olive Branch’. The border mission aims to clear the area from terrorists. 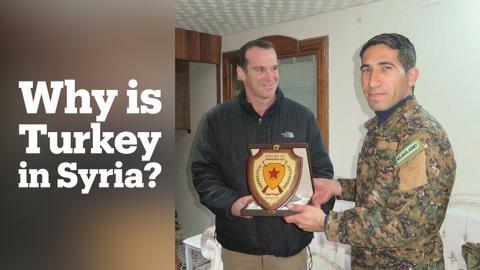 The YPG is an affiliate of the PKK, which NATO and its allies regard as a terrorist group. The YPG's expansion across huge swathes near Turkey's southern border has made a military confrontation inevitable. Turkish Armed Forces say 153 targets, including shelters, hideouts and ammunition depots used by YPG/PKK and other terror groups, have been destroyed in Operation Olive Branch in Syria's Afrin. The PKK has been designated a terrorist organisation by the US, the EU and Turkey. Since 1984, it has targeted and killed more than 7,000 civilians in terror attacks. What does the US want to do in Syria? Over the weekend the US-led coalition said it was working with the YPG, the Syrian extension of the PKK terrorist organisation, to set up a 30,000-strong border force along Syria’s border with Iraq and Turkey. How far will Operation Olive Branch extend in Syria? Turkish Armed Forces capture strategic Bursaya mountain in northern Syria’s Afrin. The YPG/PKK have used the mountain previously to launch mortar shells and missiles into Kilis in Turkey and Azaz in Syria, Anadolu Agency reports. The Turkish military began “Operation Olive Branch” on Saturday in Syria’s Afrin to eradicate the YPG that it sees as a security threat on its borders. Turkish President Recep Tayyip Erdogan has said the operation against PYD/PKK and Daesh elements in Syria's Afrin will complete “in a very short time”. President Recep Tayyip Erdogan announces plans to launch an operation to rid the Syrian city of Manbij from the YPG after Afrin. Why did the US rebrand PKK's offshoot YPG in Syria? Turkey commences a border security mission called ‘Operation Olive Branch’ in Syria’s Afrin. Here is what we know so far about the operation. Turkey and the US are at odds over the Pentagon's decision to arm the YPG in Syria. While Turkey insists that the YPG is a terrorist organisation, the US sees the group as a key ally in the battle against Daesh. Turkish mothers are hand-knitting scarves and caps for Turkish soldiers part of the cross-border military operation against the Syrian Democratic Forces, known as the YPG, the PKK-affiliated armed Kurdish militia. Turkey’s President Erdogan said the US formation of a 30,000 YPG militants on its border with Syria would be dealt with and the country’s armed forces were ready to start operations. Turkey has warned of an imminent incursion into Syria's Afrin district after Washington announced it would help Syrian Democratic Forces set up a new 30,000-strong border force. Washington needs Ankara’s "close cooperation" in achieving a new future for Syria, US Secretary of State Rex Tillerson said. The PYD/PKK fired on two hospitals in Syria’s Azez in Aleppo province. 12 mental patients were injured, four seriously, authorities of the psychiatry hospital told Anadolu Agency.